"No man is a hero to his valet." In Regency Britain, the household of a gentleman, even one of modest fortune, was supported by a legion of mostly unseen servants. In Jane Austen's Pride and Prejudice, that exquisite plus grand roman of Regency chick lit, Mr. Bennet's modest needs and the rather more extensive ones of his wife and five daughters are met with a meager staff indeed. Mrs. Hill functions as both housekeeper and cook. Housemaids Sarah and Polly––the latter still a child––clean the house, wash the extensive laundry, serve at table, and help in the kitchen. Mr. Hill, who is ailing, is responsible for the horses and the outside work with the help of only an occasional workman. This is a minimal staff for a household with five pretty, but poorly-dowered marriageable daughters, all of whom must look their best at all times. Sarah was hanging laundry, trying not to stain it with her chilblains, which the day's scrubbing in lye had opened, when she first spotted the stranger coming up the old drovers' lane. The following morning, the servants are introduced to James Smith, hired to help Mr. Hill with the heavy work. Mrs. Bennet is thrilled; she will have a proper coachman and a young footman to serve her guests at table. Mrs. Hill seems oddly ambivalent; Mr. Bennet had hired him without even informing her. Later, Sarah hears raised voices from the study––could Mrs. Hill possibly be arguing with her master? From that moment, Sarah mistrusts James Smith, although she is oddly attracted to him. When the neighboring estate of Netherfield is leased to Mr. Bingley, Sarah meets his footman, a mulatto named Ptolemy. "Tol" has ambitions; he is saving his wages and tips to open a tobacco shop in London. He seems very interested in Sarah, who is herself bored and restless with the endless drudgery and her narrow world. London sounds exotic to the country girl, who was born and orphaned within a few miles of Longbourn. But the experienced Mrs. Hill mistrusts Ptolemy, and warns him off. Sarah will eventually have to break with the only people she has known to chase her one chance at happiness and independence. 'For someone to be quite respectable," she said, "I think they must be shown respect. We build ourselves like caddis flies, out of the bits and pieces that wash around us.'" That astute and compassionate retort from the long-suffering housekeeper, whose many roles include spending countless hours dealing with Mrs. Bennet's hysteria and hypochondria, while her husband hides in his study, says quite a bit about both that marriage and the importance of the practical housekeeper in keeping the balance of the household. Mrs. Hill has become, perforce, the stand-in for her overwhelmed mistress; but Mrs. Bennet might not have become quite so silly and frivolous if she had been a little better cherished. I am usually disappointed with Austen spin-offs, but Longbourn rings true. It is a remarkably creative adjunct to Austen's beloved masterpiece, among the best I have read, ranking alongside author Pamela Aidan's wonderful retelling of the story from Darcy's perspective in her Fitzwilliam Darcy, Gentleman trilogy. Note: I received a free review copy of this book. 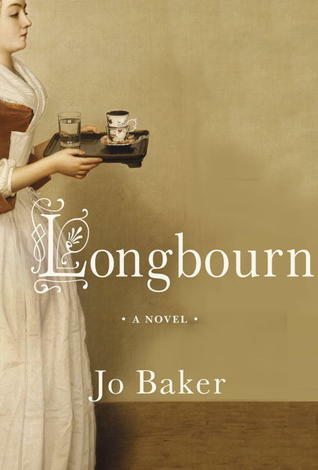 Longbourn will be released by Knopf on October 8, 2013. Nikki, it is definitely worth reading. The author didn't try to imitate Austen's dainty style and sensibility, which is all to the good. I think I'm kind of dying to read this even though I've still (STILL) not read any Jane Austen! It is something I do plan to remedy (I have a collection of Austen accumulating). Becky, I'm shocked and awed that you haven't yet read any Jane Austen. I agree LONGBOURN looks great. Maybe you should make yourself a plate of tiny sandwiches minus the crusts, pour some tea into a delicate China cup, and sorta sidle into JA via LONGBOURN. Becky, while Longbourn can stand alone, I think the references to events and characters in Pride and Prejudice make it more enjoyable. P&P is not for the harried, its pace is leisurely and its humor subtle and sharp. Longbourn is a much quicker read; I don't know if reading them in the reverse order would be as charming. May I join you ladies in a pot of tea? Haha! It's sad really. I wasn't kidding when I said I had a collection of Austen accumulating either. I think I have two versions of P&P in house currently, along with EMMA, NORTHANGER ABBEY, and maybe one or two more. And you can all come over for some tea!